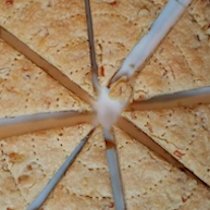 LOCAL FEATURE: The New England Biscuit Company! She’s used to the fanfare and wild applause from her days in improv, so without further ado, let’s give a warm welcome to the founder of The New England Biscuit Company, Laura Brown!!! 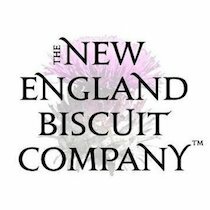 Launched in late summer 2016, The New England Biscuit Company bakes up traditional-style shortbread cookies using the finest ingredients sourced right here in New England. 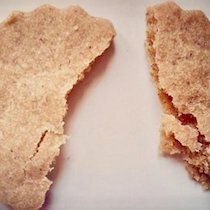 Owner, founder, baker, and seacoast entrepreneur Laura Brown set out to create a truly unique product that celebrates her Scottish roots. 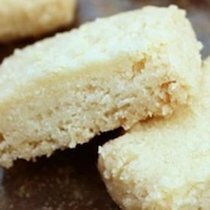 Consisting of only five ingredients (butter, sugar, flour, salt, and love), these cookies are baked to perfection with a crumbly texture and buttery taste. Are you hungry yet?? 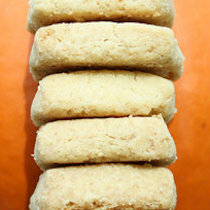 When I sat down with Laura, I knew right away that she was cut out (cookie pun!) for the job. As a well-seasoned entrepreneur (from spending many years pioneering her handmade candle business), self-taught artist and baker, and a naturally smart and kind human being, Laura will take this business to great heights. A midwest native, this Renaissance woman runs all aspects of her business – from baking and packaging, to social media and sales. 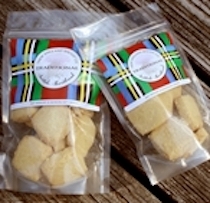 She even designed the cookie packaging, which is a modern twist on the iconic Scottish tartan print! 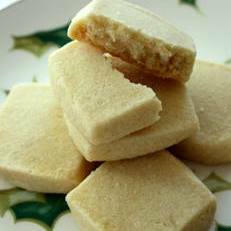 Using only the finest ingredients, Laura’s authentic Scottish shortbread cookies (crafted in her Kittery, Maine kitchen) are nothing “short” of extraordinary – they’re like buttah! As a discerning foodie, Laura sources a top-quality, European-style cultured butter with 86% butterfat. This is 5% more fat than typical American butters and it makes an award-worthy difference. 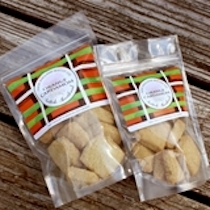 Laura can also taste the difference between mass-produced shortbreads and handmade delicacies, so you can be assured that each biscuit is sprinkled with love! 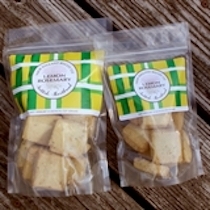 Three biscuit flavors are constantly baking in Laura’s oven – Lemon Rosemary, Orange Cardamom, and Traditional shortbread. I’ve tried them all and can rave for hours about each one. If your mouth is watering, hop over to Black Trumpet’s Stock + Spice on Ceres Street in Portsmouth, where these biscuits are currently sold. 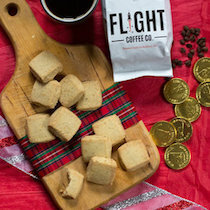 Or, if you’re thinking these might be your “go-to” holiday gift, pop on to The New England Biscuit Company’s website for our EXCLUSIVE Cyber Monday BOGO Sale! P.S. Catch Laura on TELEVISION today! 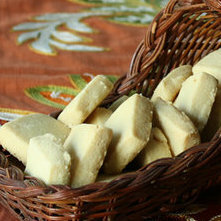 Tune into WMUR-TV, channel 9 at noon to see Laura make her shortbread cookies on “Cooks Corner”! Stuck at work? Tune in to see a previous appearance on “Cooks Corner” here! 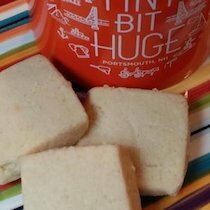 Thank you for sharing your story and yummy shortbread with us, Laura!